If you're looking for sound files, only a couple special ones are included here. Thanks to Al's Place, which is where I found these lovlies. He's got lots more, so go visit his site once you're done here. I downloaded my two absolute favorites and I'm posting and sharing them with you here. The first of my favorites is that 80's movie title hit, Footloose. It appeared in Piano Man, which aired in the spring of Season Three. The song is a duet by Sam/Joey and Lorraine Danner (played to goofy perfection by Marietta DePrima). It's a great jazzy piano version of the Kenny Loggins tune, and has the extras in the diner adding to the track with their water glasses and spoons. The second is a Gospel favorite. Amazing Grace was heard in Memphis Melody, which aired at the end of the final season. This CD is a must for any QL fan. 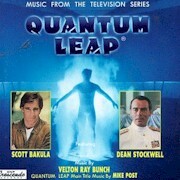 Not only does it include the opening Title sequence as voiced by Deborah Pratt as Ziggy, but it includes many of the fans' favorite songs as sung by Scott Bakula. There are few notable omissions on this disc, but I'm sure all fans are hoping that someday they'll release another disc that includes the rest of the songs that Scott brings to life so well. The symphonic selections are a treat as well. They take you right back to the episodes, letting you remember why you're a fan of the series in the first place. A few may even have you rushing to your VHS collection for the specific volume that contains the episodes so you can watch the related scene as it unfolds. One of the best parts of this CD is the interview with the man who brought Dr. Beckett to life every week. Following on the heels of the one song that sums up Sam's leaping life, Scott chats about the show in detail. For many of us, hearing and watching Sam sing Imagine to his little sister is truly one of the most memorable moments of the series. The song already pulls at your emotions because of the songwriter's death. The combination of that with Katie's realization that Sam has predicted their older brother's death and proven he spoke the truth by singing this song gets you right in the throat. So, head over to Amazon and add this beauty to your collection. Trust me; if you loved hearing Scott sing on the show, you'll love this compilation even more. This site is an affiliate of Amazon.com.